Thanks to Andreas Dünnewald, the author of the book: Brazilliance – Record Covers of Brazil (1952-1977), I am gradually nearing the 18+ tag for Parallel Realities. Yesterday he sent me this rarity wrapped in countless beautiful and not too heavily dressed ladies, fronted by Angela Maria or a lookalike of hers. After hours of staring at the artwork, I also found time to listen to organ player Celso Murilo‘s debut album, recorded in 1961. Angela or not Angela, that is now the question. Nine songs from this album were reissued on Conjunto Balambossa’s “Samba ao Vivo” (Coledisc CD012): Samba Triste, Boato, Volta, Murmúrio, Dizem Por Aí, Fica Comigo, Falsa Baiana, Fiz o Bobão and Zelão. 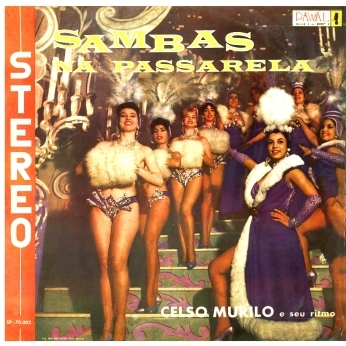 The rest of “Samba ao Vivo” was compiled from Celso Murilo’s “Órgão e Ritmo” aka “Convida a Dançar” (1963, Moeda Quebrada, O Amor em Paz) and Fats Elpidio’s “Samba da Madrugada” (1962, Na Roda do Samba).